Mousse had an ewe late this afternoon. I had to cut my weekly outing to Barnes and Nobles short this evening, because I had to be sure that the lamb was actually drinking off Mousse. Based on belly size when I got back, I was pretty sure that she was, so I held her for a few minutes, let her go and she ran directly to the teats. She knows where to go! She is brown. 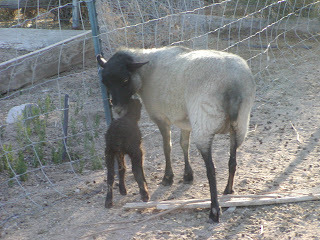 I have had a lot of brown lambs this year out of moms, who have usually given me blacks and greys. It will shake things up! I had some lovely colored fleeces this past year and expect the same this year.